Today, as we remember those killed in the Holocaust, we celebrate the lives saved on this date in 1945 when Soviets liberated Auschwitz, the largest Nazi facility. 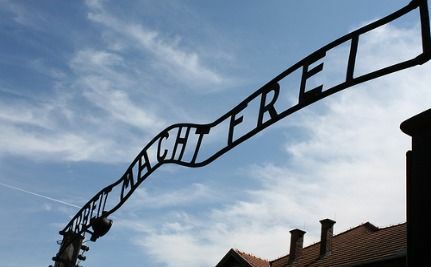 Auschwitz, a combination “concentration, extermination, and forced-labor camp,” held a mere 7,000 people when it was liberated in January of 1945. A conservative estimate is that of 1.3 million people imprisoned at Auschwitz, 1.1 million of them were killed. Prior to the liberation of Auschwitz, the SS forced over 60,000 prisoners to march westward from the camp. Over 15,000 people died during these death marches. With a plethora of photos and first-hand accounts, it’s almost impossible to ever forget what has happened. And yet, words like ‘Nazi’ and comparisons to Hitler still linger in the media today. This morning, a letter to Rupert Murdoch was published in The Wall Street Journal condemning comments made by Glenn Beck and Roger Ailes. The authors? Over 400 rabbis from the Orthodox, Conservative, Reform and Reconstructionist movements from across the United States. “In the charged political climate in the current civic debate, much is tolerated, and much is ignored or dismissed. But you diminish the memory and meaning of the Holocaust when you use it to discredit any individual or organization you disagree with. That is what Fox News has done in recent weeks, and it is not only ‘left-wing rabbis’ who think so. We share a belief that the Holocaust, of course, can and should be discussed appropriately in the media. But that is not what we have seen at Fox News. It is not appropriate to accuse a 14-year-old Jew hiding with a Christian family in Nazi-occupied Hungary of sending his people to death camps. It is not appropriate to call executives of another news agency ‘Nazis.’ And it is not appropriate to make literally hundreds of on-air references to the Holocaust and Nazis when characterizing people with whom you disagree. Will this work? I don’t know. I don’t expect Glenn Beck to be sanctioned, nor do I see Roger Ailes apologizing for his harsh words against the Jewish community. I would love to be proven wrong. But for me, this letter, published the day we remember the liberation of Auschwitz, means more than any apology. It is an example of the unity and strength of the Jewish community, a community that will not back down, despite the adversity we have faced in the past. The issue should be addressed or we keep going down the same path of destroying our fellow human being. MILLIONS!!!!! It is the number one news channel! Check it out. That is, a 14-year old! Soros has come a long way since he was a poor 24-year old boy!! Glenn Beck is a paranoid schizophrenic and needs help. He should be institutionalized, not publicly speaking. You mean people are actually watching FAUX NEWS??? ?